Light snow fell as a small contingent of birders and photographers, myself among them, peered intently at a fast-flowing stream on a freezing January evening. It was almost an hour past sunset and the surroundings were pitch black, focusing our attention on a short, illuminated section of the river where we were reliably informed our quarry would appear. Time passed and the only movement came from the falling flakes, rushing water and, ultimately, some of the gathered crowd, as patience began to be tested. The snow gradually intensified and the scene was set – a giant shadow glided towards the stream on silent wings. Their immense, broad span was unmistakable: Blakiston's Fish Owl! A collective gasp sounded as the owl, now illuminated, landed and turned its head regally to look up at us with piercing, yellow eyes. The stake-out at Rausu is the most reliable way in the world to see Blakiston's Fish Owl (Josh Jones). We were sitting at one of two publicly accessible stake-outs for Blakiston's, the world's largest owl, on the northern Japanese island of Hokkaido. In the comfort of a heated hide, observers can drink tea and shelter from the sub-zero temperatures outside as they wait for one of the local birds to appear. And, using special strobe lighting, which cuts the need for flash, photographers are able to obtain stunning images in a natural setting without any impact on the owls themselves. The bird successfully caught two fish in the 10 minutes it was on show. Watching it perform its routine of diving into the river, eyes closed, talons at the ready and wings spectacularly spread, then subsequently devour both catches in full view, made for a truly unforgettable experience. Blakiston's is one of those 'blockbuster' species that sits high on the wish lists of birders from across the world, and Hokkaido is undoubtedly the best place in which to see it. Easily reached via a 90-minute flight from Tokyo, one of the great cities of the world, the island could not be more of a contrast to the Japanese capital. Sparsely populated, full of wildlife and boasting spectacular scenery, Hokkaido remains a relative wilderness compared to the bustle of the main island of Honshu. Getting around Hokkaido is easy – typically excellent Japanese infrastructure combined with the lack of people means travelling is straightforward and stress free. Birding efforts have traditionally concentrated on sites in the east, between Kushiro and Rausu, which are only three hours' drive from each other. Distances between sites are small, the pace of birding is relaxed and the rewards are high. Another resident for which Hokkaido is famous is the impressive Red-crowned Crane. Though it can be seen throughout the year, its largely white plumage means it is at its most evocative during the snowy winter months, and nowhere does it look more so than at sunrise at Otowa Bridge near Tsurui. Views aren't close here, but it's more about the overall 'bird in habitat' experience. The cranes roost in the river, and if it's a clear night the temperature drops low enough that steam rises from the water. The mist shrouds the cranes as their forms become discernible at dawn, and as the sun rises, light conditions become enchanting for photography. Sometimes a herd of Sika Deer will appear among the cranes, their presence causing a crescendo of bugling, which only adds to the scene. If you're in luck, you'll also see the spectacular Crested Kingfisher here, although this giant can be surprisingly unobtrusive as it sits still on a favoured perch overhanging the river margins. 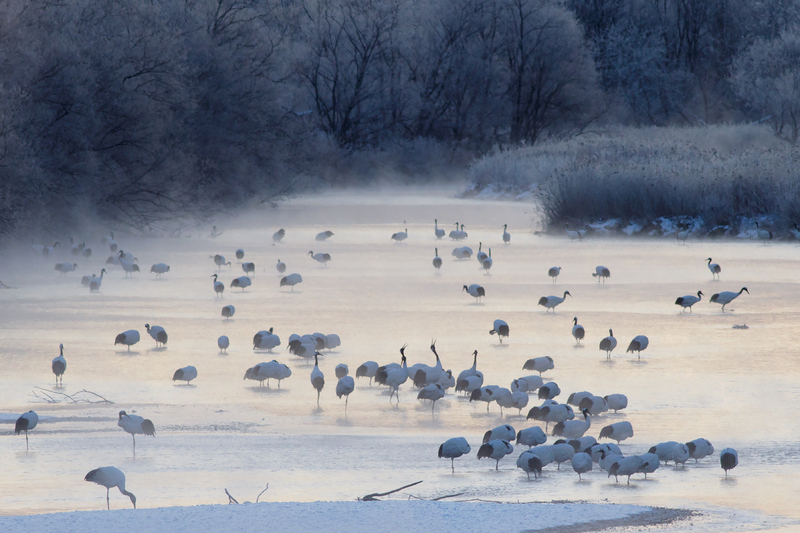 Red-crowned Cranes at dawn from Otowa Bridge near Tsurui (Josh Jones). Nearby feeding stations allow visitors to watch Red-crowned Cranes interacting and 'dancing', often at very close range, giving a completely different – though no less satisfying – viewing experience. They can also be found anywhere in roadside fields in the Tsurui area, often intermixing with Whooper Swans, and in January 2018 we also happened upon an adult Common Crane among one group of Red-crowned – the first sighting on Hokkaido for 30 years. We were struck by how much smaller it was than Red-crowned and, save for its extreme rarity, a bird very much standing in the shadow of its Japanese cousins. Having had our fill of cranes, it was time to head north-east to the island's east coast, which would give us our first shot at the last of the Hokkaido winter's 'big three'. We hadn't got far from Tsurui when the first two 'O-washi' were spotted, perched in a distant tree. Training the scope on them revealed a giant brown-and-white structure offset by an absurdly large orange-yellow bill. 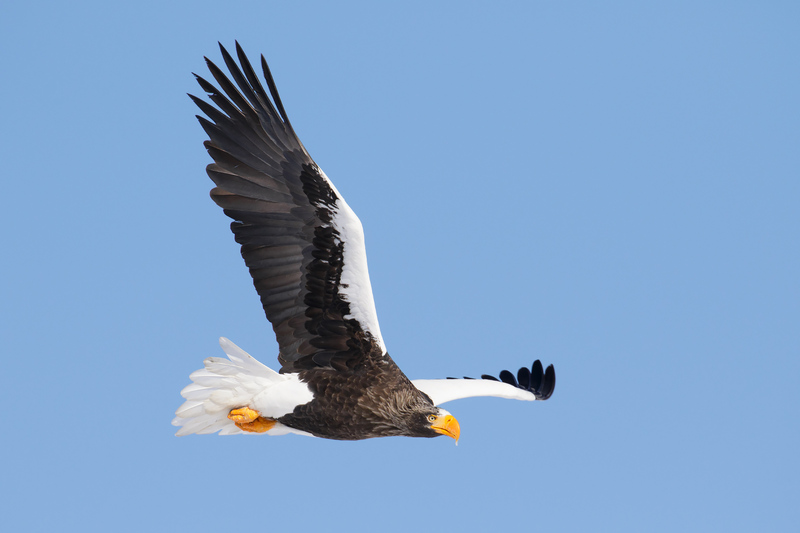 It's difficult to forget your first encounter with Steller's Sea Eagle and, while I had seen the species before on a previous trip to Hokkaido, I couldn't help but feel honoured to be reacquainted with such an immaculate product of evolution – like Blakiston's, it is the largest member of its family. But birders don't come to Hokkaido to see eagles in distant trees. The island is internationally renowned for the opportunities it offers to observe both White-tailed and Steller's Sea Eagles at close range. Here, eagles have grown accustomed to the advantages of close co-habitation with man, with many generations of both species having learned that humans, and in particular fishermen, mean food. It's not uncommon to drive through fishing towns in eastern Hokkaido and find eagles perched in roadside trees or on telegraph posts, swooping down to pick up morsels discarded from fishing boats, much as you'd expect from crows or gulls back home. It's surreal, jaw-dropping and has to be seen to be believed. Any first encounter with the magnificent 'O-washi', or Steller's Sea Eagle, leaves observers stunned (Josh Jones). As with the cranes and owls, both eagle species are routinely fed to provide birders and photographers with unique viewing opportunities. If there is pack ice, which usually appears only in the right weather conditions for a few weeks in February (if at all), then a boat trip off Rausu is essential. An alternative is at the frozen Lake Furen, with trips commencing as soon as the ice is thick enough to travel safely across in late December. On my visit, only the latter was possible, but the spectacle easily ranks as one of the most extraordinary experiences I have witnessed. Local ice fishermen deposited their unwanted catch on the ice not far from the lake shore, and within seconds, a procession of Black-eared Kites and both eagles swooped down to pick off the fish, inundating our view with hungry birds of prey. Dozens of eagles would then laze around on the ice at close range, with both species side by side, allowing us to try to figure out how such a magnificent species as White-tailed Eagle could pale into relative insignificance when sat alongside the larger Steller's. Black-eared Kites, Steller's Sea Eagle and White-tailed Eagles squabble over discarded fish at Lake Furen (Josh Jones). If that wasn't enough, both species often afford great views along the Notsuke peninsula, which has the look and feel of a Spurn-Dungeness hybrid. It's a bleak yet beautiful place, enhanced not only by its eagles but the possibility of another speciality of the Hokkaido winter, Asian Rosy Finch. This smart bird can often be found roving the peninsula in small flocks, somewhat like Snow Bunting. Scanning offshore reveals thousands of seaduck, predominately Black Scoter, but with Stejneger's Scoter, and Harlequin and Long-tailed Ducks also numerous. Sika Deer and Red Foxes are both present and, unlike their counterparts in Britain, extremely confiding – a comparative lack of hunting pressure means that wildlife is far more trustworthy in this part of the world than it is at home. For both its views and its wildlife, Notsuke is an unmissable leg of the eastern Hokkaido tour. 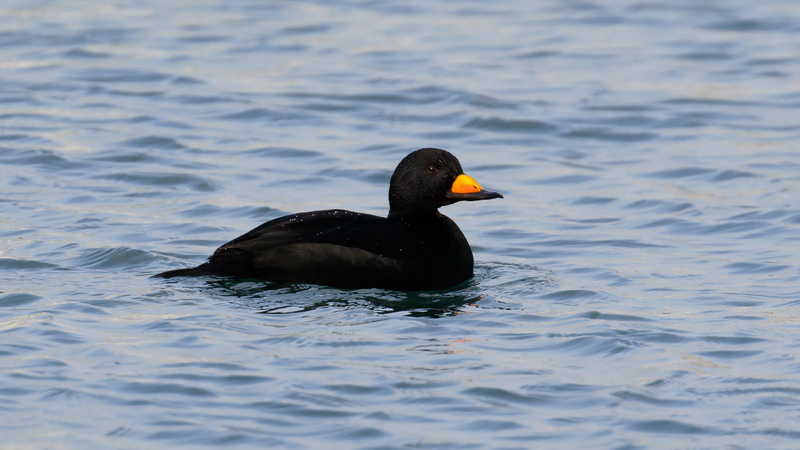 As rich as the seas are in birdlife, it is the many harbours that offer the best opportunities to observe seaduck, gulls and, sometimes, divers and auks up close. For those who have been to Varanger in northern Norway, the birding experience here is very similar. 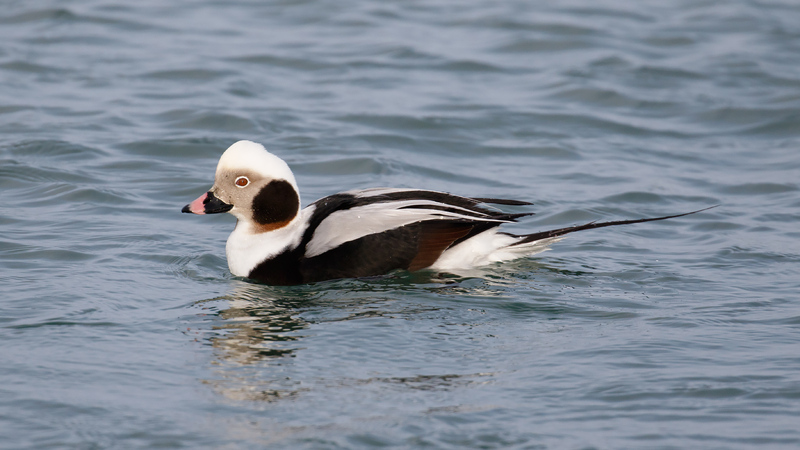 Typically, the calls of displaying Long-tailed Duck ring out around you while watching groups of Harlequin Duck and Black Scoter at point-blank range. Hokkaido's harbours offer point-blank views of seaduck such as Black Scoter (top) and Long-tailed Duck (Josh Jones). And then there are the gulls – for the larid enthusiasts, it's the perfect place to study Slaty-backed and Kamchatka Gulls of all ages, with Glaucous-winged and Glaucous Gulls also numerous. For British birders, seeing adult Glaucous is a rarity in itself, yet here on Hokkaido their ghostly apparitions are pleasantly common as they patrol the coastline against beautiful winter backdrops – and they look a hundred times better in the snowy light, seemingly glowing as they float by! 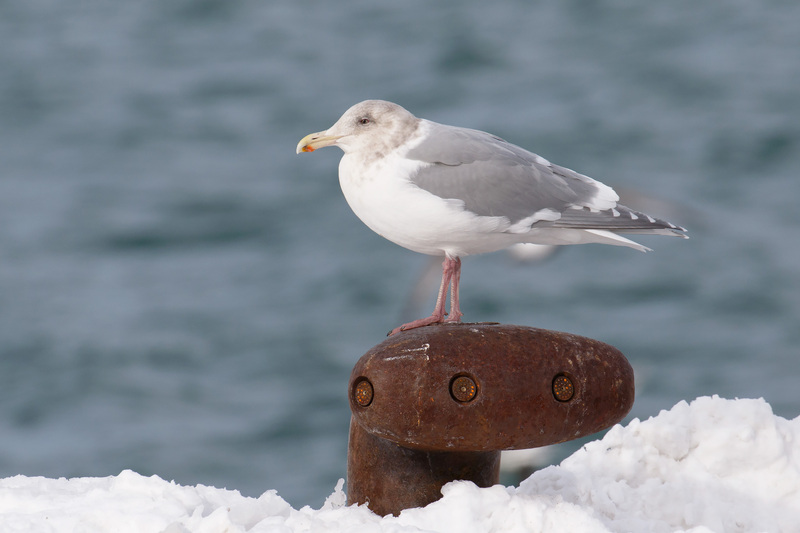 There is no shortage of fishing ports around Hokkaido's coasts, each supporting large numbers of gulls, such as this Glaucous-winged Gull (Josh Jones). Though birders have long considered February to be the peak time to visit Hokkaido, it needn't be that way – snow and ice arrive as the temperature plunges below zero from December onwards and, thanks to feeding stations, the presence of pack ice is now far from a necessity for crippling encounters with eagles. Visiting during the peak weeks of February often sees the birding hot-spots packed out and the guesthouses booked up. 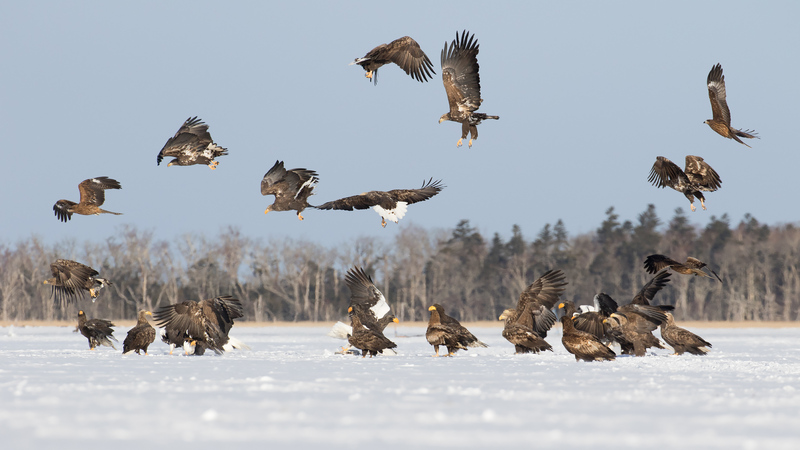 Just a few weeks before, in mid-January, I found everywhere delightfully quiet and often had the eagles to myself – certainly no jostling for the best positions for photography, which has been the case at some popular sites in the past. With such a terrific array of confiding birdlife, including some truly outstanding 'must-see' world birds, plus the bonus of unparalleled Japanese hospitality, wonderful food and sublime, wintry landscapes, it's easy to understand the appeal of a trip to Hokkaido during the winter months. It's hard to find a birder who has visited Japan and doesn't describe it as one of the best birding trips they've done, with Hokkaido routinely cited as the clear highlight of any tour of the country. I'm no exception, and I couldn't recommend it enough as a destination for spectacular birds, unrivalled photo opportunities and an all-round cultural treat. Special thanks to the Hokkaido Tourist Board and Wondertrunk & Co for organising the trip.